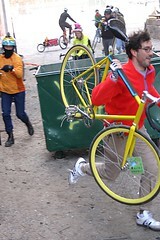 Our series of irreverent 2010 predictions tweets, included Urban Cyclocross. That’s an alleycat with runups and barriers. Followers responded that they’d like to see that and promoters are already doing it. Bilenky Cycle Works @bikehugger here you go. Still trying to track down the one we sponsored. Sounds good to me! In Houston there could be some great courses. Dicky aka teamdicky.com had a post up on his site about a race he did a few weeks ago. urban cyclocross sounds like a good time. If you want help setting one up in Seattle, let me know. In Austin, we call it alleycross, and due to our pretty light cyclocross calendar have been doing it for several years now. Photo Uploaded by ©hrisGo. We also predicted that Harajuku rides will displace Tweed. No word yet if that’s happening already.